Live in the NYC-area and looking for something fun to do tomorrow night? 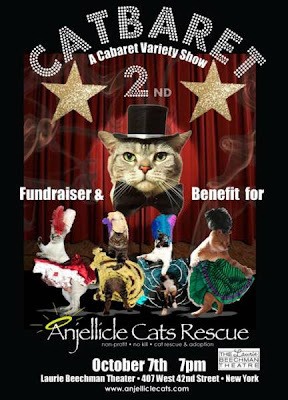 Anjellicle Cats Rescue will be presenting their 2nd Annual Catbaret, A Cabareret Variety Show at the Laurie Beechman Theater this Friday, October 7th at 7PM. Celebrate the feline qualities of life with glittering laughter, grand songs, dancing, and outrageously lovely comedy acts as Anjellicle Cats Rescue (ACR), a no kill cat rescue and adoption organization, presents the 2nd Annual Catbaret. Ninety percent of ticket sales go directly back to ACR and its efforts in rescuing New York City's many homeless and abandoned cats and kittens. Tickets are $20 and there is a $15 food/drink minimum to cover the cost of the theater. The Cabaret will provide entertainment that celebrates the feline qualities of life and feature some of ACR's adoptable cats as represented by the performers. Performances will encompass comedy acts, burlesque, dance, and song. Reservations are recommended by calling 212-695-6909, or you can click here for more information.